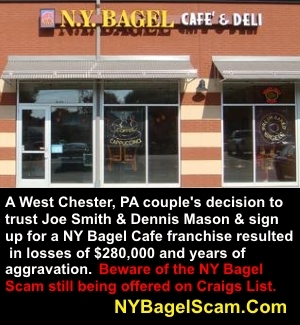 NY Bagel Café Scam continues to be promoted on Craig’s List despite the warnings on UnhappyFranchisee.Com and NYBagelScam.Com as well as investigations, lawsuits, and millions of dollars worth of fines and judgments against the scammers Joseph Smith & Dennis Mason. Like most professional con-men, both Joe Smith and Dennis Mason are very talented liars. They tell huge lies almost continuously, without missing a beat. We will be posting a series of videos featuring Joe Smith and Dennis Mason’s lies and deceptive sales pitches that victims have secretly recorded. Unfortunately for Joe Smith & Dennis, we have been compiling secret recordings of their illegal sales pitches, excerpts of which we will continue to post and debunk so that those tempted to believe them can learn the truth. This video features Joe Smith being coached by Dennis Mason, who seems to be guiding Joe so his story is consistent with the lies Dennis has already told. A prospective franchisee has asked Joe Smith about an account he read on UnhappyFranchisee.com of a NY Bagel Café & Deli franchise having closed in West Chester, PA. The prospective franchisee said he had read that a franchisee had sued NY Bagel Café and them over the failed store. At first, Joe Smith & Dennis Mason will deny that there have been ANY NY Bagel Café & Deli locations that have failed. In the deceptive and fraudulent Franchise Disclosure Documents (FDDs) they use to dupe their victims, they claim they have only ever opened 14 locations and NEVER had a failure. When they are confronted by someone who has seen evidence of a closed store or stores, they have ready-made, rehearsed stories for how those failures were completely the fault of a franchisee who wouldn’t listen or someone else (never them). There’s the NJ accountant (sometimes he’s a steel broker) who chose to take endless golf vacations rather than work in the store. There’s the false and terrible story of a young mother in California who became mentally unhinged when here husband was killed in a car accident and lost the mental faculties to run her store. There’s the fable about a location in Tennessee they only approved because of a housing development that was being built next door. The project tanked, said Joe, and so did the store. UnhappyFranchisee.Com has documented dozens of failed NY Bagel Café stores that Joe claims were never part of his system – despite the fact that they were once listed on his website as franchises. This conversation occurred in a public place at a meeting between a prospective franchise owner, NY Bagel Café President Joe Smith and his notorious franchise seller Dennis Mason (who uses many aliases, including Brian Schofield, Keith Samuels, and others). The franchise prospect asked about a legal dispute he had read about the Internet involving a NY Bagel location in West Chester, PA and a couple who had sued Dennis & Joe. In fact, the dispute did go to court – and Joe Smith, Dennis Mason & New York Bagel lost. This lawsuit arises from Defendants’ unlawful sale of a franchise to Plaintiffs. In brief, Defendants sold to Plaintiffs a franchise based on unlawful and fraudulent representations and a misleading, fraudulent, and incomplete Franchise Disclosure Document (“FDD”). Defendants made oral and written communications and provided documents to Plaintiffs that Plaintiffs relied upon in deciding to purchase an NY Bagel franchise. After opening, Plaintiffs learned that many of the oral and written communications and documents upon which they relied were false and deceptive. As a result of Plaintiffs’ reliance on information that Defendants provided, Plaintiffs have lost a substantial amount of money [$280,000] and are now potentially liable for a substantial amount of money with respect to certain lease obligations. Facing the possibility of treble damages due to fraud, Joe Smith and Dennis Mason agreed to pay the franchisees a substantial but undisclosed sum over time. It is believed that Smith & Mason made their monthly payments for a time, and then stopped paying. There is evidence that they are still being pursued by these franchisees and many others they have defrauded. One of the consistent features of Joe Smith’s and Dennis Mason’s fictional accounts of their franchise failures is the seeming need to insult and demean the former victims/franchisees. Perhaps it’s a technique to assure their next victims that they are much smarter that those who failed, or maybe they are just nasty, vindictive people who hate legitimate businesspeople. In Joe’s fictional West Chester story, he attempts to characterize two successful, law-abiding professionals as a dishonest, downsized exec and his loony new age wife. If you listen carefully to the recording, you can hear the wise old scammer Dennis Mason coaching the younger scammer Joe Smith on key words (“London,” “To build a case,”) of their rehearsed story. Dennis Mason appears to be teaching Joe smith the secrets to his success so that he, too, can enjoy his golden years avoiding process servers and lawsuit summons, and wondering who will be the next person to run across his bankruptcies, fines and criminal actions on the Internet.